This February No7 is relaunching its range of Cosmetic Brushes, including five brand new products, to make it even easier to achieve professional make up results at home. The NEW No7 Cosmetic Brushes will help you become an expert in contouring, create the perfect smokey eye and give you a gorgeous flawless base. I have never used a stippling brush before I was sent this one to try and so I cannot compare it to any others on the market already. I was curious to see how it would compare to a standard foundation brush which resembles a paint brush and can (if you are not careful) result in streaks of foundation from the brush strokes. I tend to use my fingers as it is quicker then trying to use a foundation brush to achieve a nice finish. I had no such problems with the stippling brush and I think I am a convert to be honest. Anyway, the No7 Stippling Brush is a great, affordable brush that gives a fantastic base. No7 say - Innovative and versatile, this double-ended brush is the must-have tool for the contoured effect. The angled bristles of the brush allow you to add definition, whilst the dome-shaped brush is perfect for highlighting areas of the face that naturally catch the light. 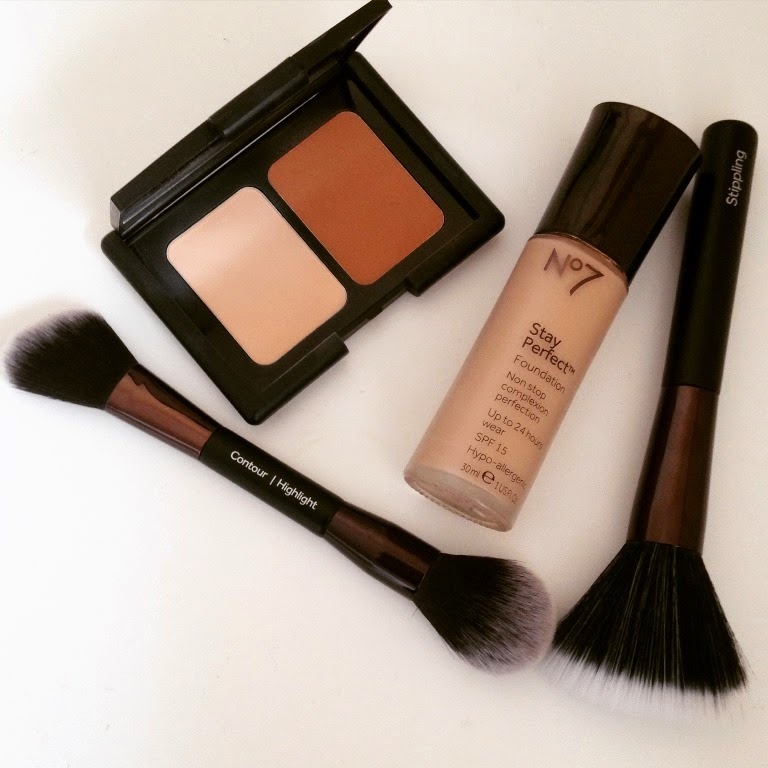 Contouring and highlighting the face is a real makeup trend at the moment and No7 have tapped into this by introducing their dual ended brush tailored for contouring and highlighting. Once again the brushes are soft but not too soft that they are ineffective and surprisingly small but actually it is perfect for precision contouring and defining. Highlighting is also easy to do with the other end. The brushes picks up product brilliantly and once the product is on the skin it is easy to blend beautifully. I can highly recommend both brushes.